Live free-dried vaccine, Thiversal strain for the active immunization of pigs against Classical Swine Fever (Hog Cholera). 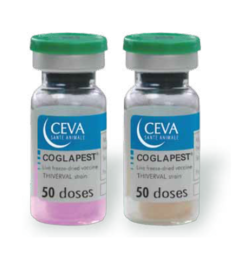 COGLAPEST® is the unique attenuated live vaccine containing the Thiverval strain. The protection is at the same time fast, strong and long lasting. The potency of the vaccine (1000 PD 50) is ten times higher than the minimum potency required by the OIE. It explains why COGLAPEST® helps to install a good homogeneity of protection and to prevent better the presence of immune-tolerant piglets. These strong qualities explain why professional farmers prefer this vaccine to protect their farms in many Asian countries. A coloured indicator allows monitoring the diluent quality for an optimized vaccine efficiency. The vaccine is prepared from the Thiverval strain, a cold mutant of the Hog Cholera virus obtained after serial passage through cytocultures at low temperature. There is no effect on the fertility of sows. After repeated passages through pigs or on cell cultures at 37° C, this strain fully retains its immunising activity and safety. The vaccine confers active immunization of pigs against Classical Swine Fever (Hog Cholera). Classical swine fever (CSF), otherwise known as hog cholera (HC) or just swine fever, is a specific viral disease of pigs. It affects no other species. It is a notifiable disease in most countries of the world.